Explains the light purple leaves an pink stalks on the vines! Gotta love Elton John’s garden! Seriously, those bushes seem to be alive? What are the chances that a PLANT would be alive? Also there seems to be a highly inappropriate, homophobic joke there involving the words “queer” and “bush” being together. The joke I was trying to make was meant at the expense of homophobic paranoia. “They’re recruiting in our schools! They’re putting gay drugs in the water! They’re sending queer plants after us!” That sort of thing. Maybe I was unclear. Sorry if I was. If this was a response to my comment, actually I wasn’t referring to your comment in any way, and didn’t find it offensive at all. Actually it was a pretty clever. No, my comment was alluding to a far more crude colloquial use of the word “bush” pertaining to female anatomy. Hey hey hey, thats an exit only! Keep your vines where I can see em. 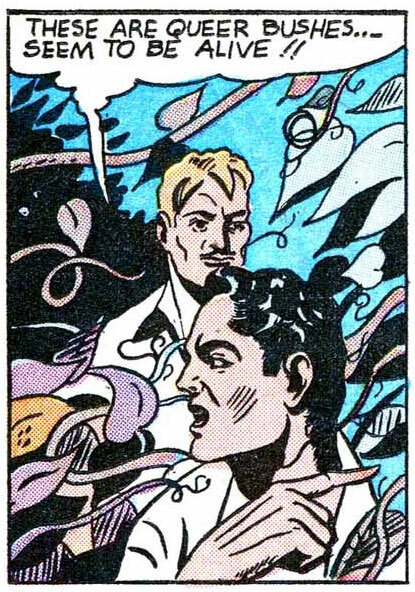 In the next panel, we found out that these queer bushes are man eaters. What-the-waa? Myro: If this was a response to my comment, actually I wasn’t referring to your comment in any way, and didn’t find it offensive at all.Actually it was a pretty clever. Rule #376: If you are entertaining or heroic or a potential red-shirt, burn or poison all foliage of odd colors that you happen to encounter.